If you have property that you’d like the district to consider purchasing, please download, fill out and return the land acquisition form to the district’s Real Estate Services Program. Either mail to the address on the form or email to RealEstateServices@sjrwmd.com. When the St. Johns River Water Management District has purchased land, the benefits are far-reaching for the public and the environment. The district’s main goal of buying land has been to protect water resources. In addition, these lands protect plant and wildlife habitat and provide areas for public recreation and environmental education. Virtually all district property is open to the public for activities that are compatible with conservation. A few areas of district lands are closed because of ongoing construction or restoration projects. The district has selected land for purchase based on the potential for preserving, restoring, enhancing or developing water resources in the district’s 18-county region. The district has looked for priority lands providing water resources protection such as floodplains, sensitive wetlands and groundwater recharge areas. Over the years, most of the funding for land purchases has come from Florida’s Save Our Rivers and Preservation 2000 programs established by the Legislature. 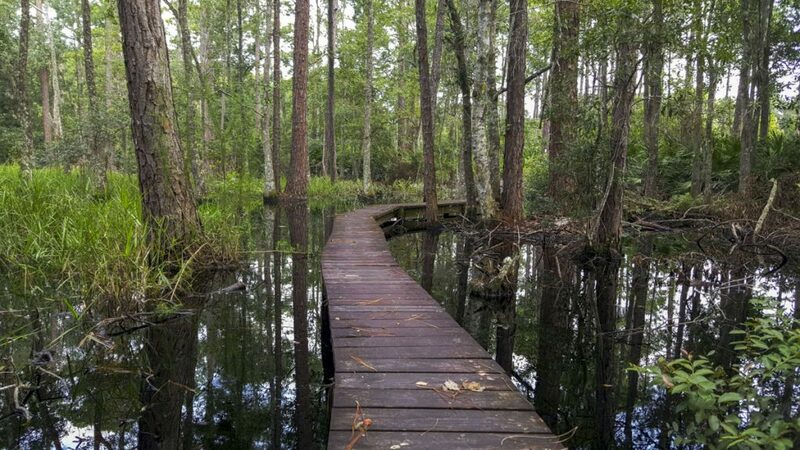 In the most recent decade, beginning in 2000, land has been purchased through the Florida Forever program, which has also funded environmental restoration and water resource development. The district actively pursues partnerships with other state agencies, local governments and nonprofit organizations. In fact, most of the district’s lands have been either purchased in cooperation with, or are being managed in cooperation with, other groups. The district encourages visitors to take advantage of environmental education and recreational opportunities on these lands. One of the many ways the St. Johns River Water Management District meets its mission to preserve and protect Florida’s water resources is by acquiring and managing lands. To maximize the use of land acquisition and management moneys, the 1996 Florida Legislature amended state statutes to encourage the use of alternatives to “fee simple acquisition.” Fee simple acquisition means the district purchases the complete package of land, including all the rights to it. The alternative, known as the “less-than-fee” alternative, minimizes the district’s expenditures while allowing private landowners to continue managing the land with activities compatible with conservation. The public benefits greatly when the district uses this alternative. Natural resources are protected at a reduced cost to taxpayers. Private property remains on tax rolls for county or city income. Private owners continue to use their land (with restrictions) and are respons­ible for managing the land, helping the district to avoid management costs. The district also may negotiate public access to the land for recreational purposes. All restrictions, terms and conditions of less-than-fee acquisitions are negotiated with the owners of the land.